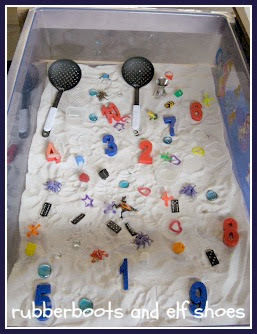 Since we are celebrating Day 100 this week, the sand table was transformed from an antarctic penguin habitat to a numbers I Spy search and discover zone. 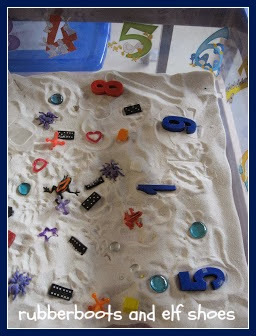 I put in a set of numbers 1 through 10, removable number wall clings, and then added various items. It's still a work in progress - I would like some coloured cups or containers instead of the clear plastic ones, and something with more "scope for the imagination" than the unifix cubes. I am sure that the kids will have some better ideas than I did. Thank you Shauna. It is now officially a red letter day. I have just ordered my white sand the beginning of June and absolutely will steal this great idea. What about buttons instead of unifix cubes? 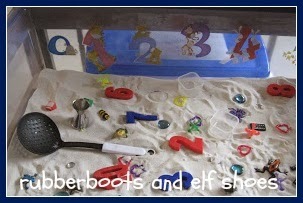 There are so many beautiful buttons out there; shiny, sparkly, colourful, big, small, etc. Buttons would be a great idea! Something sparkly would be grand.